It's interesting to see how Hamilton had so many nautical models in their line up. There are so many that many model names were used two or three times. A good example is the Sea Rover III. The original Sea Rover was introduced in 1960. 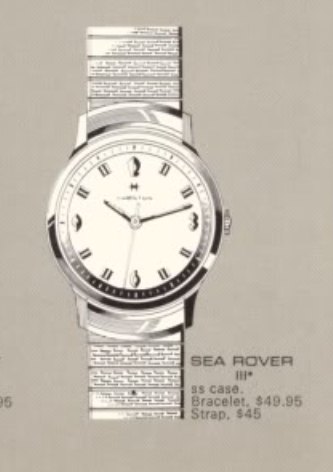 A case change to stainless steel resulted in the Sea Rover B in 1961. Then in 1960 the Sea Rover II was introduced. Finally, in 1968 the Sea Rover III entered the line up. The Sea Rover III came in a stainless steel case with a matching bracelet or leather strap. It was produced through 1969. Inside is a manual winding Hamilton 688, produced by ETA. I recently snagged a Sea Rover III project watch. It was in good shape but looked a little grungy in the seller's photos. I was hopeful I'd be able to clean it up nicely. The case back is inscribed with a presentation that seems especially fitting. The Sea Rover III opens through the crystal and once it's removed, the crown can be turned to reveal the opening in the two-piece stem. Then the movement can be leveraged out of the case using the stem as a hinge. You need to be careful to align the stem though so you don't break it. Here you can see the female side of the stem. This is what you look for when you turn the crown. That ensures the stem can pivot on the male side attached to the crown. The Hamilton 688 looks like an automatic 689 or 689 without it's rotor installed. The crystal was a bit scratched but the real concern is the the dial is a bit grungy. It looks like the hood of a white car that's covered in pollen after a light rain. Little spots are evenly distributed over the entire surface. With luck it will clean right off. I'll get out a new crystal to install after everything is reassembled. Everything is cleaned and dried. I wasn't able to get the dial to look any better. In fact, I was probably 5 seconds away from losing the printing in HAMILTON. It's still there fortunately. With the movement reassembled and running, it's off to the timer. Well, that's not too shabby but I can slow it down very easily with a slight tweak of the regulator. Everything goes back into the case and a fresh strap is installed to complete the restoration. The hour markers and numerals are faceted so they are very reflective. The dial is a little splotchy but at least the Hamilton logo is still mostly there.